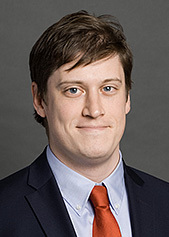 Jackson Phinney is an associate in Cadwalader’s Capital Markets Group. His practice is concentrated in the area of structured finance, with an emphasis on representing investment banks and financial institutions in their roles as issuers, underwriters and mortgage loan sellers in public and private commercial mortgage-backed securitization (CMBS) transactions. Jackson received his J.D. from the University of Virginia School of Law and a B.A. from the University of Delaware, where he was elected to Phi Beta Kappa. He is admitted to practice in the state of New York.